Berlin has become the first capital city to introduce a wireless-charged electric bus. 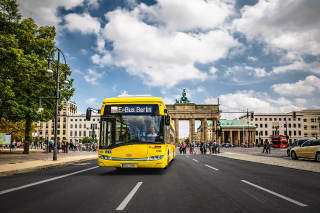 The Berlin Transport Authority, Berliner Verkehrsbetriebe (BVG) has introduced four Solaris Urbino 12 electric buses equipped with the Bombardier Primove inductive charging system and traction equipment from Vossloh Kiepe, operating on a 6.1 km route. BVG says that within one year, the four electric buses on this line will travel a total of approximately 200,000 km, saving 260 tons of CO2 emissions.